Make delicious homemade sausage easy with the Weston Brand Mahogany Casing. 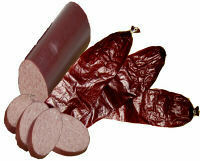 These non-edible casings are used for summer sausages, lunch meats, semi-dried or dried pepperoni. They allow for excellent smoke penetration and at the same time are very strong for tight stuffing and shrinkage. Each casing is string-tied on one end. To close the open end of the sausage after stuffing, you can use hog-rings, twist ties or twine to insure a tight seal. Available in two sizes: 1.5" x 12" and 2.5" x 20"